Just like reading, math follows us through life and is a skill set we can all improve on. Students in grades 1 through 8 have been assigned an IXL account, they can access their account at https://ca.ixl.com . Please encourage your child to complete math homework nightly and set a weekly games night at your house. Math is fun amd playing games with your child at home will enhance their acquisition of math skills. Cribbage, Rummy, Monopoly and Dominoes are just a few of the games that you could play as a family. Blaise Pascal was born on June 19, 1623 in Clermont-Ferrand, France. Pascal was a French mathematician, physicist, inventor writer and Christian philosopher. He was a child prodigy who was educated by his father, a tax collector, in Rouen. 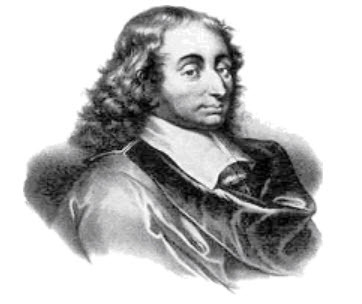 Pascal's earliest work was focused on applied natural sciences where he made important contributions to the study of fluids. In 1642, at the age of 18, inspired by the idea of making his father's job of calculating taxes easier, Pascal invented the pascaline, which is an early calculator. The pascaline was a numerical wheel calculator with eight movable dials, each representing a numerical digit, such as ones, tens, and hundreds. The pascaline calculator was proficient at carrying simple operations such as addition, subtraction, multiplication, and division. Pascal continued to influence mathematics throughout his life. In 1653, his Traité du triangle arithmétique-Treatise on the Arithmetical Triangle was used as an efficient presentation for binomial coefficients, and it is now a day's known as Pascal's triangle. Initially, Pascal read about this triangle in a Chinese book. He studied it rigorously, and is credited by having the honour of this triangle being in his name. Pascal struggled with insomnia and a painful digestive disorder called dyspepsia from the time he was a teen, and over the years, Pascal's constant work took a toll on his already fragile health. Pascal died from malignant stomach tumor on August 19, 1662. By that time, the tumor had spread into his brain. He was 39 years old at the time of his death. Conway, John. Guy, Richard. The Book of Numbers. Copernicus Books.